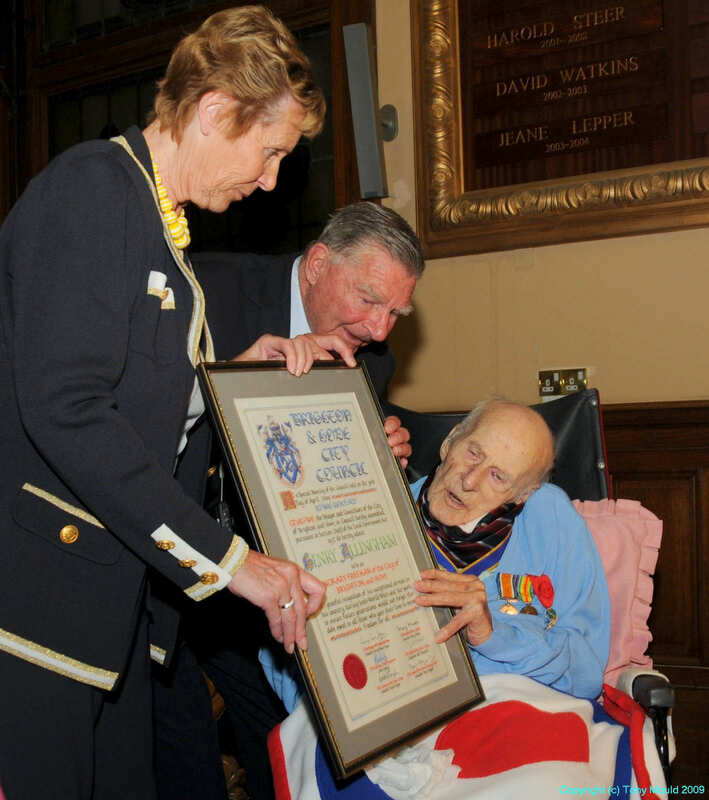 The Mace Bearer of the city of Brighton and Hove, Newhaven councillor Robert Robertson, himself a service veteran swops memories with Henry. 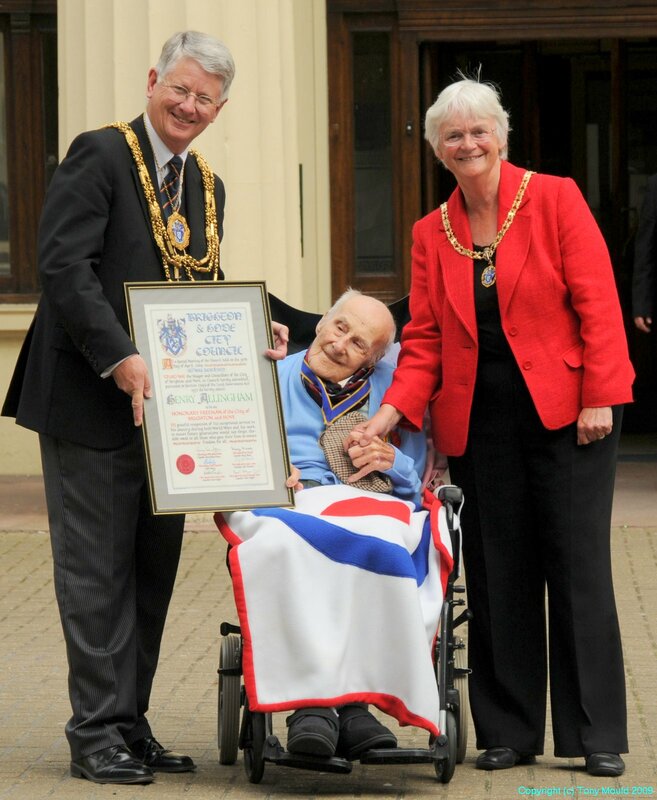 At the ripe old age of 112 Britain’s oldest living man Henry Allingham was made an Honorary Freeman of the city of Brighton and Hove at a ceremony held on April 30th 2009. 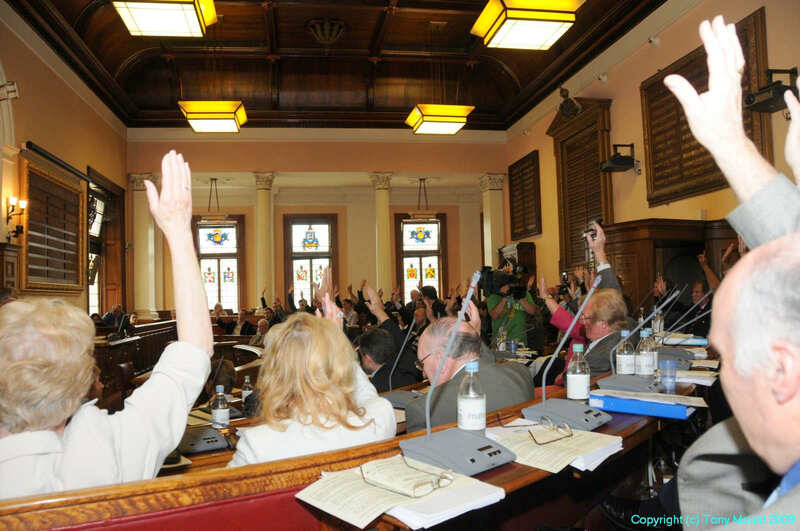 The award of the title of Honorary Freeman requires a special resolution of the council, and two thirds of the members must vote in favour. 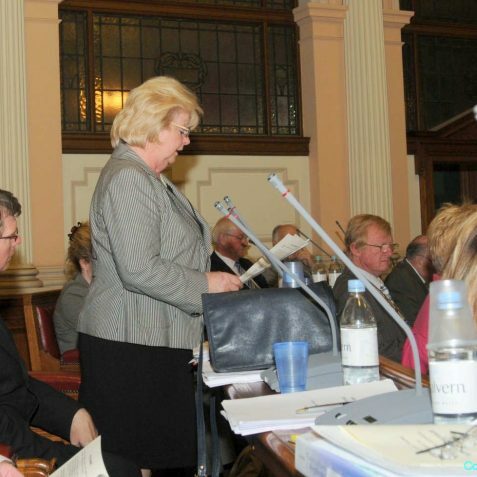 Brighton and Hove City Council leader Mary Mears led the members of the council in voting for the award to be authorised “in grateful recognition of his exceptional services during both World Wars and his work to ensure future generations do not forget the debt owed to all those who gave their lives to ensure freedom for all” at a meeting earlier in the day; the vote was unanimous. 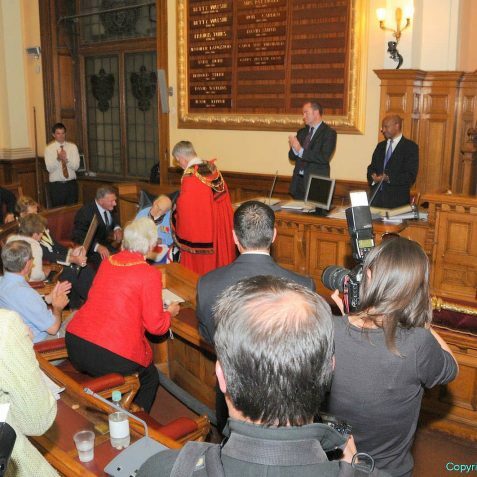 Mr. Allingham received the award from the mayor of Brighton and Hove, Garry Peltzer Dunn who presented him with a framed certificate in the packed council chamber. Mr. Allingham also took tea in the mayor’s parlour and posed for the press and television reporters at the Town Hall. 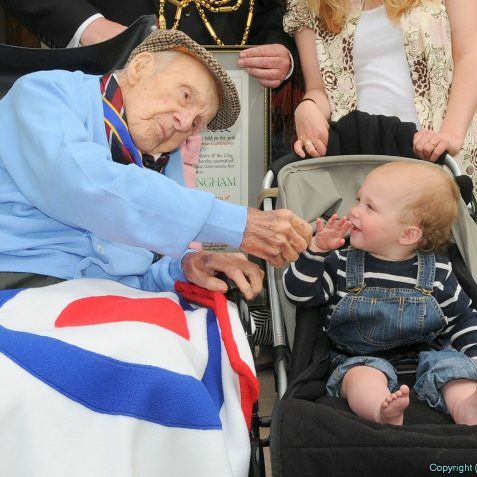 In addition to being Britain’s oldest man, Henry is also he oldest surviving member of any of the British Armed Forces. 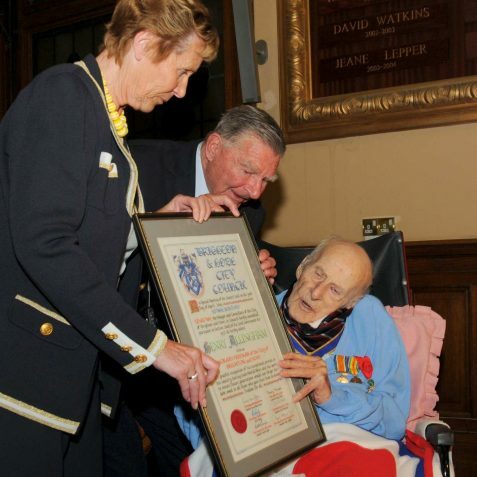 He is also the oldest surviving veteran of the First World War, the oldest Royal Navy veteran and the last surviving founding member of the Royal Air Force. 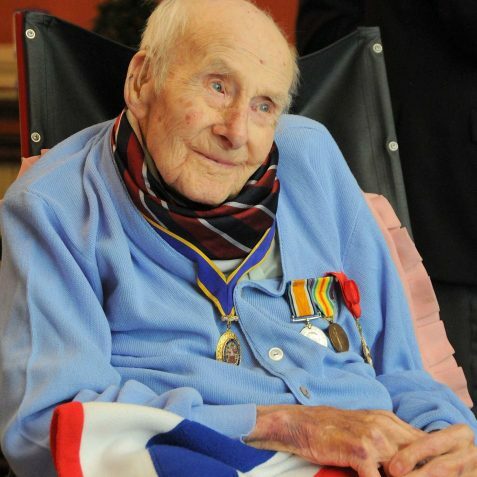 He is one of only two men left who served in the Great War. Henry was born on June 6th 1896 when Queen Victoria was on the throne, and seven years before the Wright brothers made their first aeroplane flight. He joined the Royal Naval Air Service in September 1915 and saw action during the battle of Jutland, and then ashore in France while attached to the Royal Flying Corp in the Ypres and the Somme. During World War Two Henry worked for the Admiralty on combating magnetic mines. 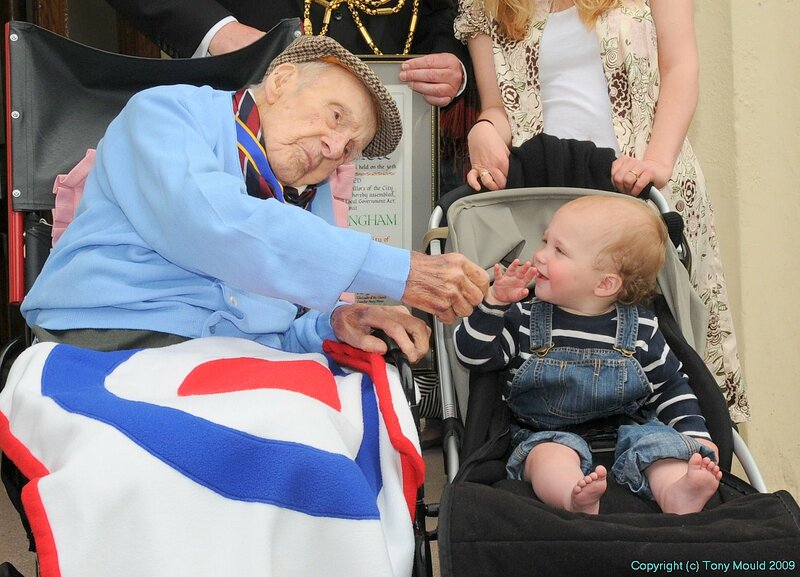 Henry now lives at the St Dunstan’s residential care centre for blind ex-servicemen and women in Ovingdean. 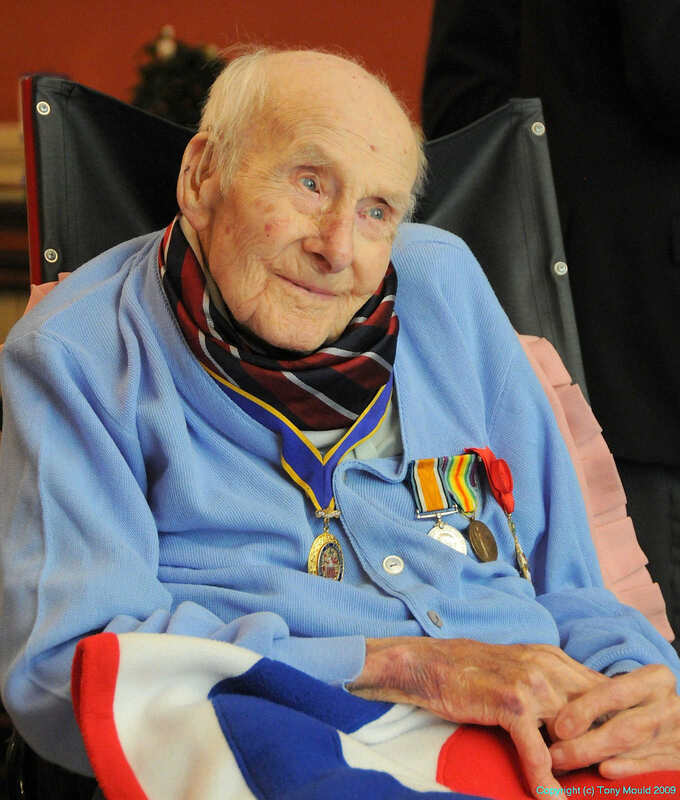 I watched Henry Allingham, 112, Harry Patch, 110, and William Stone, 108, the only other known surviving veterans of the Great War in Britain, at the Cenotaph in London on Tuesday November 11  for a service of remembrance. 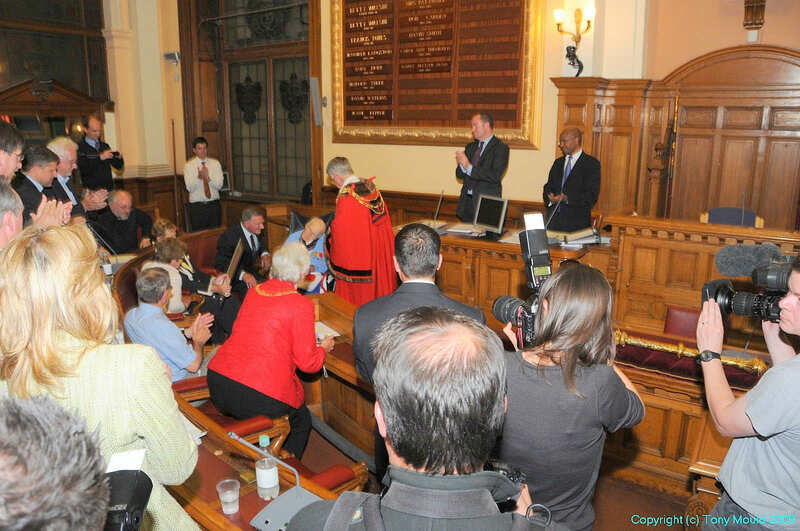 Glad he was made Honorary Freeman of the city of Brighton and Hove. Bless him. 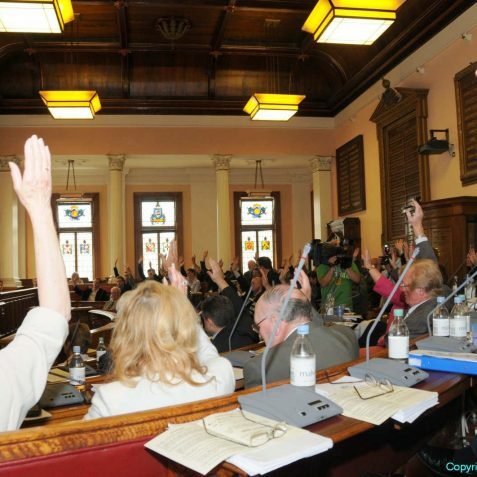 Taken from the Brighton Argus today 22 May 2009. 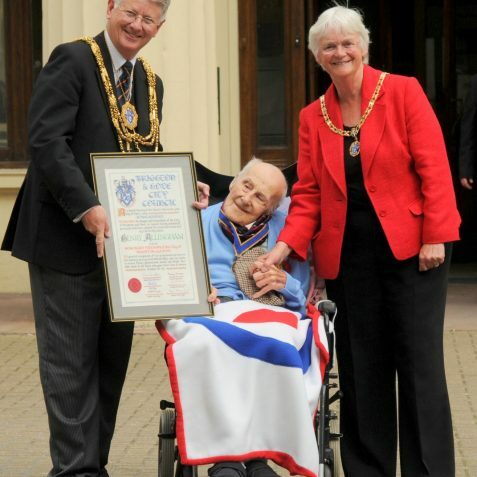 Henry Allingham, aged 112, who lives at St Dunstan’s in Ovingdean, is being given a doctorate in engineering at Southampton Solent University. 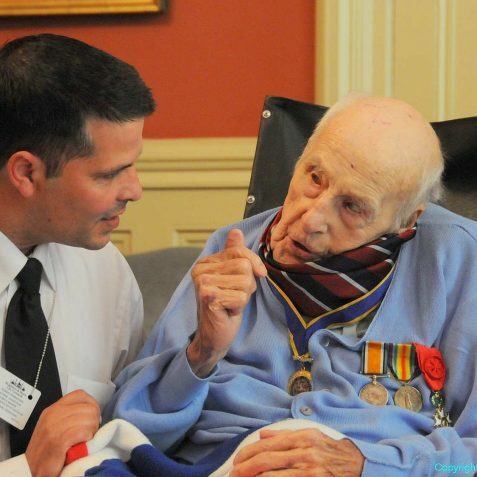 It will be for his charity work and contributions during the two world wars. A statement from the university said: “For a man who said he felt woefully under-qualified during his career, as he had no formal engineering qualifications, finally being awarded a doctorate will be a special thrill”. What a lovely moment. Henry must be 110 years older than his young friend there. Very sweet photo. 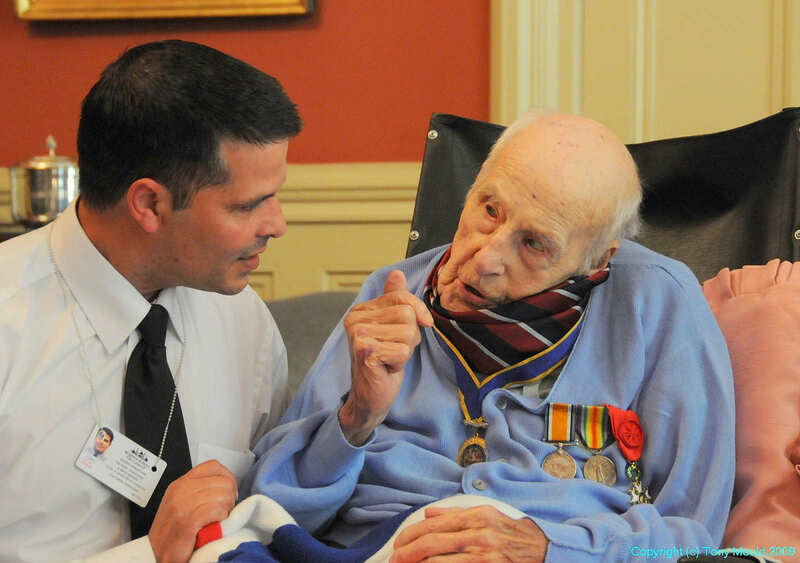 Henry is also the world’s oldest Scout. Thank you for these beautiful pictures of Henry. I expect that everyone knows by now that Henry is believed to be the oldest man in the world! 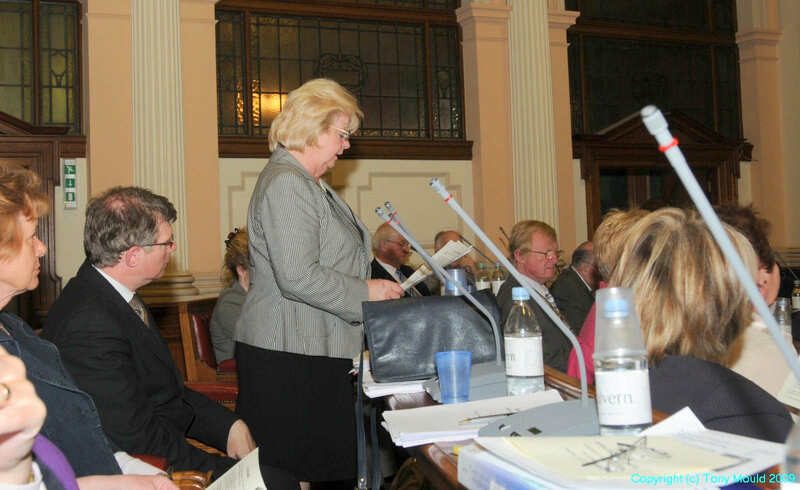 (Source, St Dunstans Review. July. 2009) Best wishes Henry, from one of your fans. Henry died today (18/07/2009) aged 113. Lovely service at St Nicholas Church today for Henry.